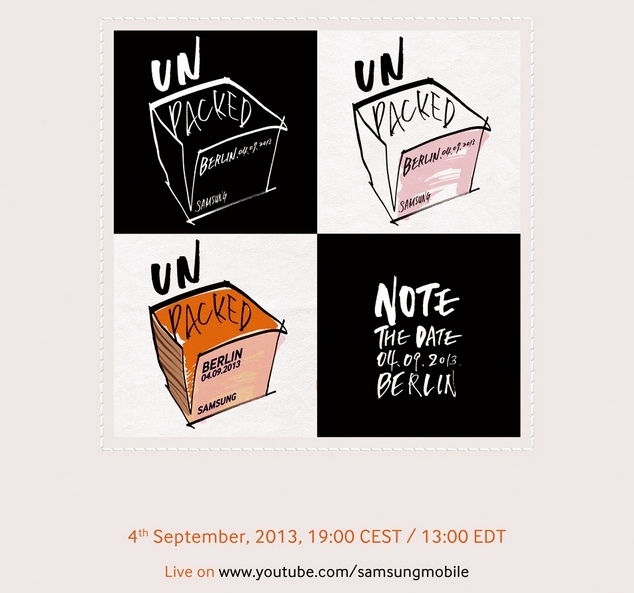 Galaxy Note fans, mark September 4 onto your calendars. Actually, as Samsung has put it in their official invite, “note the date” on your calendars. Yes, this will be the unveiling of their next “Galaxy” at an Unpacked event just ahead of IFA in Berlin. But as you can tell, they aren’t trying to keep it a secret – it’ll be the Galaxy Note 3. The event will be streamed live for the world to see, much like they have done with almost all of their big events over the last year or so. Since the actual event is being held in Berlin, this won’t be a repeat of the Galaxy S4’s Radio City Music hall launch, but you should still expect it to be a big production. This is Samsung we are talking about. Keep in mind that while the event will showcase the Note 3, we don’t have any idea when it will launch. After all, it took Verizon months to release the Note 2 after it was announced last year, however, most other carriers had the device available fairly quickly. For those big on history, the two previous Galaxy Note devices were both announced just prior to IFA.